you’ll find the Little House in the Garden. Television, electric heat, refrigerator, microwave, oven, stove, toaster, electric pot. In the loft area, bed for two persons, and bathroom with shower. Garden furniture and barbecue, private parking. Baby bed on request. No smoking. This charming guest house is situated on a private property of 30,000 square feet. Golf courses in equestrian center the area. We stayed at the Petite Maison for 6 months during a work assignment. The property & owners are fantastic & there was nothing that was too much trouble. The gite is iin a lovely garden & surrounding countryside, is very comfortable & includes everything needed. 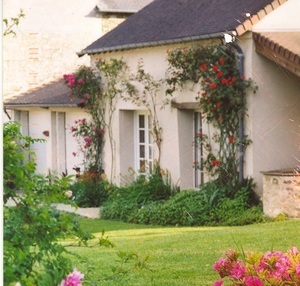 Mr & Mrs Cadrout looked after us like 5* guests & we recommend the gite without hesitation.